Some years back, William Christenberry got himself into a pickle. His work appeared in “Passing Time,” a 2006 survey at the Smithsonian American Art Museum, and some workers there were leery of his work, specifically the Ku Klux Klan images. He had worked the Klan into many of his pictures, sometimes subtly, sometimes not. So he spoke to an assembly, about his work, about his station, to mollify the museum’s black staffers. Presumably he spoke to them about the delicate use–mention distinction in his art: that he was citing the Klan, not endorsing them. That he was making images about hate, not heritage. Christenberry’s fading South is perpetually fading. It has been always. For decades he has been returning to his ancestral home in Hale County, Ala., just south of Tuscaloosa, and photographing the roads, houses, schools, barns, and churches of a place and time that is always just out of reach. The only thing that seems to change in his photos is the creep of kudzu. All the heritage and hate remain. His latest show at Hemphill Fine Arts comes at a time of unlikely promise and harrowing return for the South. Bree Newsome, an activist, snatched the Confederate battle flag off the top of a memorial on the capitol grounds in Columbia, S.C., just one state over from Christenberry’s Alabama. That was only days after South Carolina Gov. Nikki Haley pledged to work with the legislature to remove it formally. A massacre inside a black church prompted these scenes of sincere uplift; a rash of black church burnings has since swept across the South. Grace and rot are twinned in Christenberry’s photos. “Kudzu and House, Tuscaloosa County, Alabama, 1989” (2015) is the kind of image he seeks out. He’s shot this same structure in the 1970s, ‘80s, and ‘90s, always from the same vantage point, over a field of snaking kudzu, set nobly against a big blue sky. By 1989, the vines have overtaken the structure’s chimney. Two regal oaks out front don’t look safe. That’s just one of the sites to which Christenberry has returned over and over for his haunting frames. “Building with False Brick Siding, 1974” (1981) is a print from a photo Christenberry first took with a Brownie. (For the film nerds: It’s a dye-transfer contact print from the original 3x5” negative.) By the time he re-photographed the building in 1991 (in a picture that isn’t on view), the detailing is barely visible through the kudzu. Taking Christenberry’s work for restive or pastoral is a mistake. The artist’s more recent paintings are vivid and gestural: nothing at all like his patient, deliberate photos. Christenberry’s work is deeply committed to modernism. Consider his Warhol-esque pop lithographs of various iconic advertisements (Royal Crown cola, Tops snuff, palmistry). 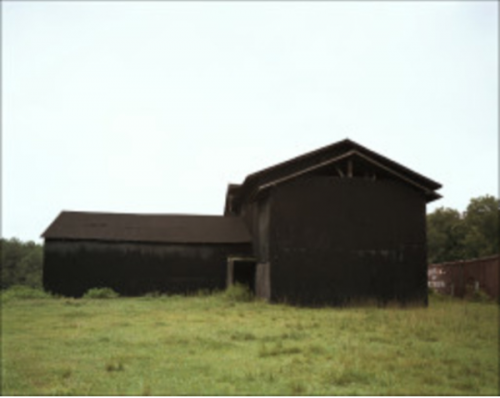 One electric painting rendered in beeswax and encaustic (“Green Form,” 2001) is a geometric reduction of a barn that is also tense and textured: something between Ellsworth Kelly and Anselm Kiefer. Christenberry’s catholic interest in the modes of modernism is demonstrated by the breadth of the show. Several of his latest paintings in particular look like the early (very early) mythical works by Mark Rothko and Jackson Pollock. But where these artists eventually turned inward to find nature—or to repetition to find whatever Warhol found—Christenberry simply never left the South. “Church, Sprott, Alabama, 1981” (2015) is as fine an example of Christenberry’s photography as you’ll find. The photo depicts a simple gabled-roof building with twin steeple towers, a typical church to be found throughout the Black Belt. Another print on view, based on a 1971 Kodachrome, depicts the same building. In both shots, the church is unspoiled. But black churches are hardly ever stable. They were built to adapt, evolving physically to the constant changes forced on black congregations. Those changes are felt as keenly today as they were when he first began shooting the South. Christenberry captures the fading south in medias res. In “China Grove Church, Hale County, Alabama, 1979” (2013), he depicts a small white structure off at the end of a wide dirt road lined by lush vegetation. The church may have since been consumed—by fire or by kudzu—but nothing about this past is truly behind us. It never retreats, the kudzu, but it never gets what it wants, either, which is everything. Over many years Christenberry has embraced the vines as a metaphor: a graceful marker of the past, a sign of change and entropy, slow and deliberate and violent.